There’s certainly no accounting as to why Ben Affleck (“Gone Girl”) would choose this, The Accountant, a tepid and convoluted thriller to star in, but all I know is I wish I could deduct the two-plus hours I spent at the cinema to see it; time I will never get back in a refund next year. Here, as directed by Gavin O’Connor (“Warrior,” but probably best known for 2004’s “Miracle”), Affleck plays a financial idiot savant who is also an expert in martial arts, firearms an other self defense skills, making this a “Rain Man” meets “A Beautiful Mind” meets “Shooter” experience. Oh, and he is also basically indestructible like Jason Bourne and Jack Reacher, so add those characters, too, if you like. Anyway, after a violent and confusing opening segment, we are introduced to Christian Wolff (Affleck) as a youngster (played by Seth Lee, “Underdog Kids”) in flashback trying to assemble a jigsaw puzzle, but freaking out when he loses a piece (the puzzle, by the way, turns out to be Muhammad Ali’s second fight with Sonny Liston, but he puts it together upside down so he cannot see it; that shows early on just how smart he’s supposed to be). He also lives in a house of weirdos, including a brother who doesn’t speak, a spastic sister, an absent mother, as well as a military father who hires grown men to beat up his sons to teach them valuable life lessons. Later, we see that Wolff has a small CPA business and saves a client on their taxes with a little-known loophole (another example of just how smart he is, or how stupid we viewers are). Meanwhile, two U.S. Treasury agents, Ray King (Academy Award winner J.K. Simmons, “Whiplash”) and Marybeth Medina (Cynthia Addai-Robinson, “Colombiana”), are trying to track the math whiz down because he is allegedly involved in dealings with some of the world’s most notorious drug smugglers, arms dealers and assassins, helping them launder their ill-gotten gains through a series of small, cash-only businesses. While this is going on, Wolff is hired by a Chicago robotics firm led by Lamar Black (John Lithgow, “Interstellar”) to work with a low-level clerk, Dana (Anna Kendrick, “Into the Woods”), who discovered millions of dollars missing from the firm. In addition, Jeffrey Tambor is in the movie because, well, he’s Jeffrey Tambor and just won an Emmy and Golden Globe for playing a transsexual in the TV “comedy,” “Transparent,” I guess. Wolff is also being chased by a hitman (Jon Bernthal, “Sicario”), who will later reveal a huge surprise that’s not so surprising to many. Christian, who suffers from the still-mysterious Asperger’s Syndrome (a form of autism), hates small talk, disdains people for the most part and can only calm down by watching strobe light, listening to excruciatingly loud music and beating his shin with a wooden nightstick (this, it seems, is O’Connor and Affleck’s interpretation of what people with autism are really like). Once he discovers that Dana may be the next victim, however, something wakes inside of him and soon hundreds begin to die by various and sundry means (shot, stabbed, crushed, broken, broiled, smashed, etc.). We even get a graphic torture scene, just in case we don’t get all of the other violence. As this continues, the audience is suffering from a boredom overdose or completely flummoxed by the muddled, insipid plot, dreadful pacing and ridiculously unbelievable acting (for example, Kendrick is too bad to actually be believed in this film and Addai-Robinson is almost as terrible, while veterans Simmons and Lithgow should really have known better). Then, after all of the carnage and another twist Stevie Wonder could have seen coming, the picture finally crawls to a conclusion at least 30 minutes overdue (much of which has Agent King explaining everything in more flashbacks) and a closing shot which is practically a frantic plea for a sequel (please, in the name of all that’s holy, NO!). Simply put, The Accountant is a psychological thriller that is neither psychological nor thrilling. One would have to either be immune to such filmcraft qualities as proper execution, a decent story, coherence, brevity and lucidity to find The Accountant even slightly enjoyable, or be a real-life accountant rooting for someone in your profession to be a Hollywood action hero. Either view is just sad and it’s amazing that this is Affleck’s second worst “super hero” performance of the last 12 months (“Batman v Superman: Dawn of Justice,” in case you forgot). Talk about a financial depression . . .
Are you saying you don’t like Die Hard, Lethal Weapon, Commando, etc.? 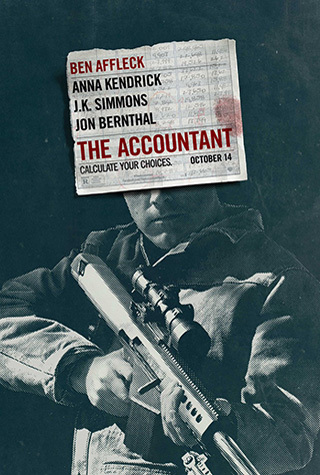 Because The Accountant is justas good as the best 80’s action-thrillers. It’s the Batman with a calculator and sniper rifle! a) Affleck, who is a stiff actor any way, does good in the role of an introvert. b) The fights are choreographed well and no Bourne shaky cam to make me nauseous. c) Concept of office worker by day assassin at night is interesting. d) Anna Kendrick always make me smile. At least Ben will always have Argo and Good Will Hunting on his resume as a reminder of when he did something good. He’s got more good than that on his resume. There’s Gigli, Daredevil, Pearl Harbor, Armageddon ..